In the fertility world, vitrification is used for cryopreservation of eggs, embryos, and sperm. Generally speaking, vitrification is a method of transforming something into a glass-like substance. It comes from the Latin root vitreum, which means glass. Vitrification technology is used to transform sand into glass, to give ceramic pots their glossy finished look, and to stabilize nuclear waster for safer disposal. Vitrification has improved the success of cryopreservation. The old methods involved a slow freeze, while vitrification is extremely quick. How quick? During the vitrification, an embryo or egg is cooled off by thousands of degrees per minute. What Is Vitrification? How Does It Work? Until recently, the only method for freezing oocytes (or unfertilized eggs) was a slow-freezing method. This worked okay for freezing sperm or embryos. However, for eggs, the slow freeze process had many problems. Ice crystals were a major issue. Eggs contain a lot of water, compared to sperm and even embryos. Freezing eggs led to crystal formation. These crystals broke down the egg. To help minimize the number of ice crystals, scientists would remove some of the water. But it's impossible to remove all the water. When the eggs were thawed, they were damaged and frequently unusable. Fertilization and pregnancy rates for these slow-frozen eggs were low. With vitrification, the freezing process is so fast that ice crystals don’t have a chance to form. Vitrification has made egg freezing a much more viable option for women. Vitrification is also being used for embryo and sperm cryopreservation. Research is ongoing, but so far, pregnancy rates seem higher with vitrification. How Does Vitrification of Eggs Work? Vitrification of eggs requires high concentrations of cryopreservants, or an anti-freeze substance. Because anti-freeze is potentially toxic to the egg, the technique requires special care. The oocyte is first placed in a bath with a lower concentration anti-freeze. The solution also contains some sucrose, or sugar, to help draw water out of the egg. Next, the egg is placed in a highly concentrated bath of anti-freeze for less than one minute, while being instantaneously frozen. The eggs can then be stored in special cryogenic freezers, made for this purpose. The eggs are held in tiny straws. When it's time to thaw the egg, the oocyte must be warmed quickly and removed from the solution immediately. Once thawed, the egg can be fertilized using IVF with ICSI. ICSI involves taking a single sperm and injecting it directing into the egg. Regular IVF isn’t possible because the freezing process hardens the eggs outer membrane. Vitrification can be used to cryopreserve embryos, eggs, sperm, and even ovarian tissue. To preserve fertility before cancer treatment: some cancer treatments cause sterility. If a woman freezes her eggs, or a man freezes his sperm, he may be able to use the egg or sperm after cancer treatments to have a child. Ovarian tissue freezing is a relatively new technology, one that is especially helpful for young girls. If she hasn’t gone through puberty, it’s not possible to retrieve mature eggs from the ovaries. However, ovarian tissue can be frozen. The technique is still experimental. Medical condition that may impact fertility in future: if a woman is at risk for early menopause or primary ovarian insufficiency (also known as premature ovarian failure), she can freeze her eggs when she’s younger and still has healthy eggs left. 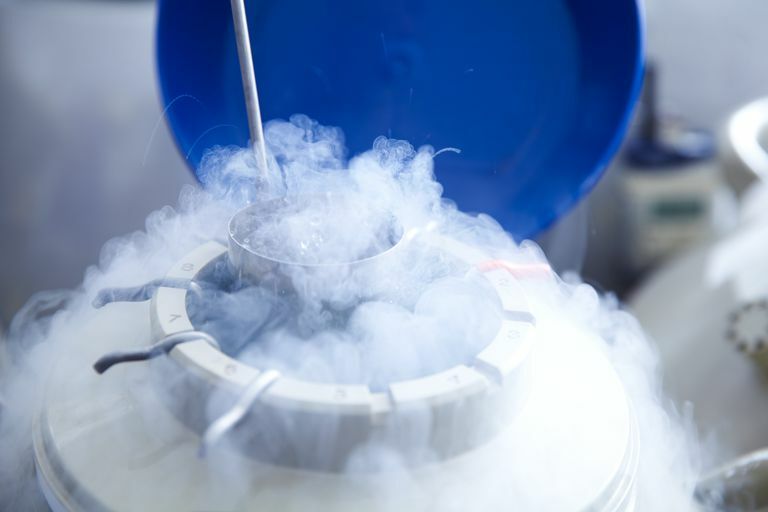 Freeze embryos after IVF: Any extra embryos left during an IVF cycle can be cryopreserved with vitrification. So far, research has found greater success with embryos frozen via vitrification, as opposed to the slower process. Egg donor banks: It used to be that if you needed an egg donor for IVF, the donor had to go through the fertility treatment process at the exact same time as you did. It involved regulating both of your cycles to occur at the exact same time. It is an expensive and complicated process. People still do “fresh donor” cycles. But with egg banks, thanks to vitrification technology, you can get previously frozen eggs to use during IVF. The cost is slightly less. Extend childbearing years: egg freezing in order to avoid age-related infertility is still controversial. The American Society of Reproductive Medicine is against the idea, saying that the technique is too new. Research hasn’t clearly shown the potential benefits outweigh the risks. Only a few hundred pregnancies have come from vitrified egg freezing, and none of those included eggs frozen for years at a time. The majority of the research focuses on eggs frozen for a matter of hours or months. From the other side, fertility doctors marketing vitrification claim that the latest research shows that the technique is successful. They believe it is time to release the new technology to those that want to try it. What Are the Risks of Vitrification? How Successful Is It? So far, the research looks promising when comparing slow-freeze to vitrification. There are concerns over exposure to the cryopreservants. New methods are always being looked at, to further reduce the time eggs, sperm or embryos are exposed to the potentially toxic chemicals. According to the latest research, pregnancy and live birth rates are better with eggs, sperm, and embryos that were frozen with vitrification. Also, there doesn’t seem to be an increased risk of birth defects in the children. However, the technology is new. Much more research needs to be done. Also, it’s important to remember there are no guarantees of pregnancy success. Not every cryopreserved egg or embryo will survive the warming process. Not every thawed egg will become fertilized. Not every embryo will develop and be healthy enough to transfer. This is extremely important to understand if you’re freezing your eggs to extend your childbearing years. ASRM Urges Caution, Strong Counseling for Women Seeking Egg Freezing. Press Release. Highlights from the 63rd Annual Meeting of the American Society of Reproductive Medicine. Accessed September 23, 2008. Cobo A, Domingo J, Alamá P, Pérez S, Remohí J, Pellicer A, and Almenar-Cubells D. "Oocyte vitrification: A new approach for fertility preservation in cancer patients." Journal of Clinical Oncology. 26: 2008 (May 20 suppl; abstr 20727). Cobo A, Kuwayama M, Pérez S, Ruiz A, Pellicer A, and Remohí J. "Comparison of concomitant outcome achieved with fresh and cryopreserved donor oocytes vitrified by the Cryotop method." Fertility and Sterility. 2008 Jun; 89(6):1657-64. Epub 2007 Sep 24. Lucena E, Bernal DP, Lucena C, Rojas A, Moran A, and Lucena A. "Successful ongoing pregnancies after vitrification of oocytes." Fertility and Sterility. 2006 Jan; 85(1):108-11. What's It Like Choosing an Egg Donor and Having a Donor Conceived Child?